What would you do if you found a large sign reading “Do not touch” hanging over a large red shiny button? The clown that enters the stage cannot resist the temptation and, just as many of us would do in similar situation, finds a way to ignore the warning and presses the button. The siren sounds and dynamic lights flash across the stage. 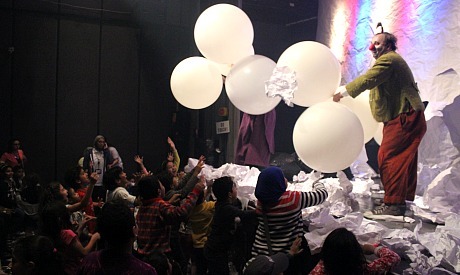 What follows is boundless commotion, fun and children’s laughter, all provided by the performance of the Theatre of Physical Comedy (USA) in Aga Boom that opened the 6th Hakawy International Arts Festival for Children on Friday, 4 March, at the Hanager Arts Centre (Cairo Opera Grounds). From the tempting red button to the papers and baloons flying across the auditorium, one cannot think of a better show to launch a festival that targets the youngest audience. The 10-day event is filled with plays from all around the world, hand picked by Mohamed El-Ghawy, founder and artistic director of the festival. Aga Boom has a special position in the festival’s history. While each year El-Ghawy makes sure to bring new performances to Egyptian viewers, Aga Boom is the only one visiting the festival for the second time. 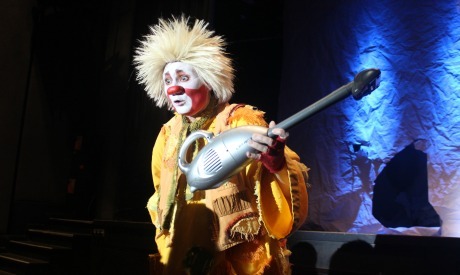 We still remember the enormous crowd — and occasional skirmishes between parents wanting to assure their children catch the show — which filled the theatre back in 2013, when Aga Boom paid their first visit. Pressured by the young audience asking for the performance, this year, El-Ghawy not only decided to re-invite the show but also, unlike 2013, he brought it’s complete 75-minute long version (instead of 45 minutes) that is staged a total of 10 times during the festival. Aga Boom is not limited to children. It is a show that the whole family can enjoy. Created by veteran of Cirque Du Soleil member Dimitri Bogatirev, the show crosses all barriers, be they cultural, social or linguistic, reaching out with clownesque fun and theatrical professionalism to the hearts and minds of all attendees. 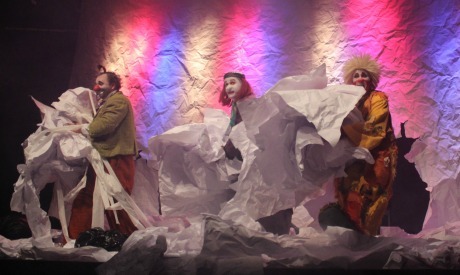 The three clown protagonists, who are comics each unique in his own way, captivate with their energy and excitement. The absurd situations, slapstick humour, unexpected turns and funny stunts are among the many elements used by the performers to create zeal and excitement among the young audience. Since its creation several years ago, the show toured many countries around the world, in each received with fullsome applause. Aga Boom was nominated for the Ovation Award in the category of best touring show. Following Aga Boom, which heated up the audience, the first day of the festival continued with a word from the organisers followed by other shows, including Pling, Little Thing from Germany, Sticks Stones from Australia, and the opening of the exhibition of Khadija El-Dessouky. The festival continues until 14 March. Australia is represented by the Bunk Puppets troupe performing Sticks Stones Broken Bones. Germany comes with Theatre o.N. performing Pling, Little Thing. From Switzerland, El-Ghawy brought Rigolo Swiss Nouveau Cirque performing Sanddorn Balance, “an unimagined, outlandish sculpture of equilibrium,” as the troupe’s website describes it. 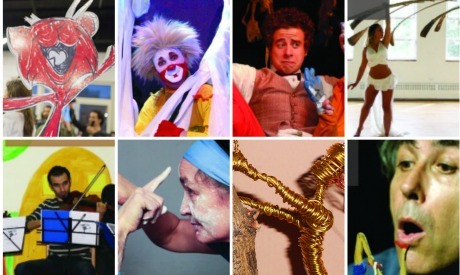 The Velo Theatre, from France, will stage a show titled Enveloppes et Debalages (Envelopes and Unpacking), while Egypt joins forces with Sweden in a performance Jinan, which fuses classical music with Pippi Longstocking storytelling. In parallel, the festival includes workshops and highlights the work of young sculptor Khadija El-Dessouky in a solo exhibition.